_The present church of St Mary Abbots is only 120 years old, but there has been a community of worship here for some 1000 years. After 700 AD, the Saxon sons of Cynesinge founded a settlement or ‘tun’ near or on the land where St Mary Abbots now stands. The name ‘Cynesingetun’ developed into Kensington. After the Norman Conquest, the manor of ‘Chenesiton’ was given to Aubrey de Vere; and the Domesday Book records that a priest held 15 acres of land in Kensington. Around 1100, Godfrey, Aubrey’s son, fell seriously ill and was cured by Faritius, Abbot of the great Benedictine Abbey of St Mary at Abingdon. On his deathbed, Godfrey bequeathed the church in Kensington, with 270 acres, to the abbey. In 1260 the abbey established a parish in Kensington, dedicated to St Mary and possibly then given the epithet of ‘Abbots’, which may not be an English possessive, but a form of ecclesia Beate Marie Abbatis. _But the church had been established without the approval of the Bishop of London so an action ensued in the consistory court of the diocese. As a result, the patronage of the church was preserved in perpetuity to the Bishop of London - a right he still possesses; and a wealthy independent parish was established - although certain rights over the land were retained by the abbey. In 1370 the Norman church was rebuilt but no records remain of its appearance. 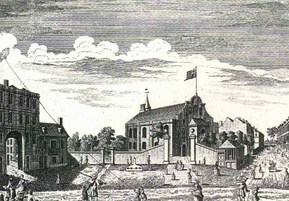 The Dissolution of the Monasteries led to the confiscation by the Crown of the Abbey’s Kensington lands. King William III’s establishment of the Court at Kensington Palace led to a considerable growth in the local population. The medieval church was thought too small and also unsafe and was demolished at the end of the 17th century and replaced by a late Renaissance church.